Xin Hu is an informatics research scientist in NCATS’ Division of Pre-Clinical Innovation. He works on a variety of drug discovery programs and provides bioinformatics and computational modeling support. 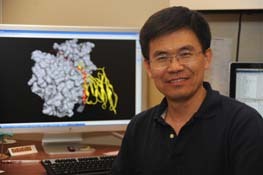 Before joining NCATS in 2010, Hu served as a research scientist at the Biotechnology High Performance Computing Software Applications Institute, where he worked with biologists and crystallographers for molecular modeling and structure-based drug design to combat biowarfare agents for the U.S. Department of Defense. Previously, as a pharmacist at the National Institutes for Food and Drug Control in China, Hu acquired more than six years of experience in drug analysis, regulatory evaluation and applications for clinical trials. Hu received a B.S. in pharmacy at Peking University and a Ph.D. in pharmaceutical sciences at North Dakota State University. As a postdoctoral fellow in the Laboratory of Structural Microbiology at the Rockefeller University, he focused his research on the bacterial type III secretion system and identified novel inhibitors targeting virulence factors for drug development. Hu’s research interests focus on large-scale high-throughput virtual screening and computer-aided drug design using molecular modeling and docking approaches. In close collaboration with biologists and medicinal chemists, Hu is interested in development of a high-performance computing pipeline that integrates state-of-the-art chemoinformatics and computational techniques for efficient drug repurposing and rational drug design. Identification of novel anti-hepatitis C virus agents by a quantitative high throughput screen in a cell-based infection assay. Repurposing of the antihistamine chlorcyclizine and related compounds for treatment of hepatitis C virus infection. Structural insight into exosite binding and discovery of novel exosite inhibitors of botulinum neurotoxin serotype A through in silico screening. 3-substituted indole inhibitors against Francisella tularensis FabI identified by structure-based virtual screening. Inhibitors of the Yersinia protein tyrosine phosphatase through high throughput and virtual screening approaches.